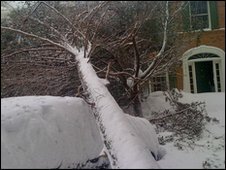 Some 300,000 homes are without electricity in Maryland and neighbouring Virginia – the two states which bore the brunt of the storm. “We have a lot of scattered outages and the road conditions are not really working with us,” spokesman Andre Francis told AFP news agency. The massive storm brought the nation’s capital to a virtual standstill. All flights were cancelled out of Washington’s national airport, along with most flights out of Dulles International in Virginia. 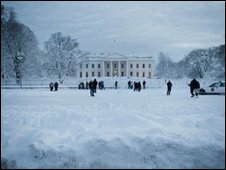 Even President Barack Obama fell victim to “snowmageddon”, as locals – including the president – have dubbed it. A tree limb snapped and fell onto a vehicle in Mr Obama’s motorcade, but no-one was injured. All across the region, hundreds of car accidents were reported, but only two fatalities – a father and son who died while helping another motorist in Virginia. The usually traffic-heavy roads of the capital were deserted, and the city’s famous sites and monuments were covered with snow.